By trying to make room for other users of the trail or to avoid a puddle, riders who swerve off the trail and into the surrounding landscape damage slow-growing vegetation and help the trail become too wide and overly disturbed. So, help preserve the "single" in "singletrack." Most riders know that when encountering a puddle, you should ride straight through rather than going around and widening the trail. A group of mountain bikers in Fruita, Colorado, have also recognized how riding off trail damages their delicate desert landscape, so they offer some tips on how to promote "trail integrity." The following info was excerpted from the website of Over the Edge Sports, the organization that developed and promotes this campaign in Fruita. The rule of "yield to everyone" isn't right! Too often, riders who meet at a point in the trail just ride OFF TRAIL around each other. That is NOT a yield at all; that's "I'm too much in a hurry to be slowed by you." In most cases, the rule applies to allow the rider moving uphill to pass because paused downhill riders can more easily restart their ride than paused uphill riders. LEAN your bike and/or slide it a bit to the side. The rider you are YEILDING TO then can pass without leaving the track. AWESOME! If we simply pass each other by riding off the trail and into the landscape, we're essentially creating a trail that's two bikes wide and, thus, NOT SINGLETRACK. Trails wide enough for two bikes to pass each other without one having to stop are called "roads." Keep Singletrack Single is our rule. Thanks for being a part of that passion for narrow, beautiful trails. , and the City of SLO have teamed up to fund and develop bike bell boxes for several local trails to promote good neighbor behavior. 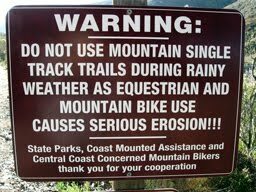 Just another way we're trying to keep everyone on trail and getting along so we can all enjoy the trails in the way we prefer, whether hiking, cycling, or riding horseback.